Make It Right, like so many other private organizations and community and church groups, is doing its part to move the Gulf Coast further on the path of recovery. But while the American people continue to step up, the Bush Administration continues to fail. 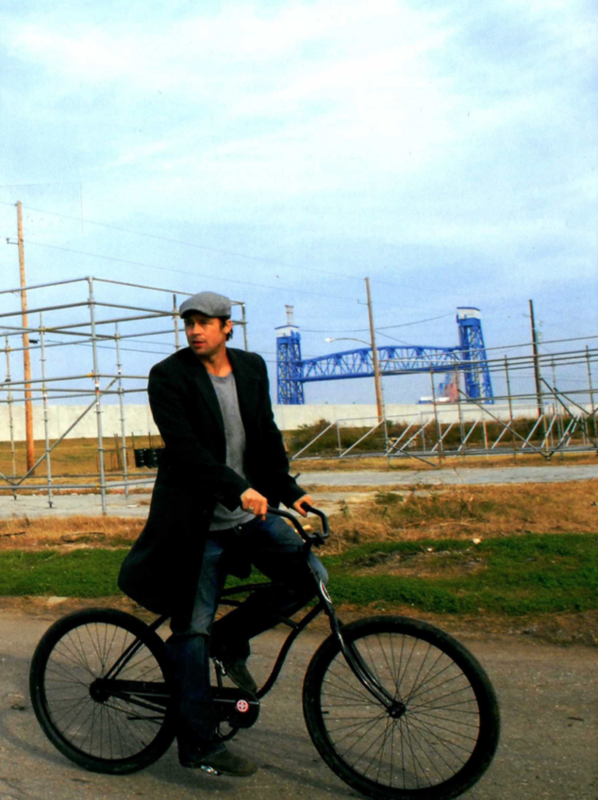 A photo of Brad Pitt in the Lower Ninth Ward, in Make It Right’s book, Architecture in Times of Need: Make It Right Rebuilding New Orleans’ Lower Ninth Ward. A particular image is peppered throughout the literature about MIR—in profiles in Architectural Digest, commentary in The Guardian, and in the organization’s own book, Architecture in Times of Need: Make It Right Rebuilding New Orleans’ Lower Ninth Ward. It is an image of an unsmiling, thoughtful Brad Pitt, alone, in the Lower Ninth Ward. On his bike in front of some scaffolding, sitting on some steps strangely unattached to a building, or walking down a gravel road amidst a series of storm-battered houses on the brink of collapse, it seems that the goal of each photographer was to capture Pitt’s singular contemplative presence in the face of desolation. But Pitt wasn’t hesitant to note his motives with MIR that spanned beyond mere goodwill, either. A self-described “architecture junkie,” Pitt saw rebuilding the Lower Ninth as an opportunity to create something that had never been done. “The holy grail of architecture is finding ways to design sustainable communities,” he said in the interview. Almost from the beginning, the cache of People magazine’s two-time Sexiest Man Alive winner cast a depoliticizing veneer onto his organization. Distracted by photos of Pitt riding his bike around the Lower Ninth Ward with his children, the media’s coverage gradually worked to strip MIR of any partisan leanings, and therefore any partisan critique. The public’s attention shifted from the political implications of Pitt’s interference in the Lower Ninth to the celebrity’s simple, a-political mission to build houses for people who need them. The series of decisions and actions that made Pitt’s intervention necessary, however, reveals how political his organization really is. Even after the massive failures of evacuation and search-and-rescue during the storm (not to mention the fact that the levees broke in the first place), local, state, and federal authorities weren’t shy about using recovery to favor a select few while completely ignoring others. Rather, they were brazen. Borne out of these blatant injustices, MIR was less about righting nature’s wrongs, than man’s. In other words, if presented with a time in which a society and environment is in such a paralyzing state of shock—a blank map, if you will—be standing by with the policies and partnerships of your dreams, ready to rebuild from the ground up using ideas that would never make it past Congress, or City Council, or the Better Business Bureau, in normal circumstances. And do it before people notice. In New Orleans, disaster capitalists literally made a map. In 2006, the same group that made the pro-free-market list in Dallas, by then dubbed the “Bring New Orleans Back Commission,” proposed a now infamous map designed by the Urban Land Institute (ULI) to “shrink the city’s footprint.” (ULI was at one time chaired by Joseph Canizaro, a wealthy New Orleans developer who was, conveniently, a member of the Bring New Orleans Back Commission.) On the map, the Lower Ninth and several other neighborhoods were covered with green dots, which marked those areas a future “green spaces” where development would be banned. Needless to say, the map was met with immediate uproar and quickly disappeared. Other clues about who was really welcomed back home after the storm—victims of Katrina and the shock doctrine both—weren’t hard to find. Thousands lost their jobs as Nagin and Blanco gutted the public municipal and educational systems, a bitter break in an already impoverished city. Without financial support, thousands were stranded in cities across the country; many of them gave up on the bureaucracy and stayed where there were more job prospects and better public benefits. In 2008, federal and state government was sued by housing activists for discrimination in Road Home, a federally-funded program designed to financially support residents who needed help rebuilding (the Obama administration settled in 2011). Other kinds of aid weren’t enough, either. So extensive was the wreckage that it soon became clear that the larger national nonprofits who stepped in after the storm also had limits. The Red Cross provides support immediately after crises, but no longer than that (and was later criticized for its startling lack of preparedness for Katrina efforts), and Habitat for Humanity could only work so fast and do so much, given the fact that their crews were made up largely of volunteers, not professional builders. There’s also the sheer quantity of houses that were destroyed or severely damaged in the storm: 350,000. Would anyone else have stepped in so grandly and determinedly for the people of the Lower Ninth Ward if Brad Pitt hadn’t taken up “making it right” as his own personal mission? Possibly. More likely to have happened, though, is that residents who wanted to return home to reclaim some part of their lives would have had to continue to deal with an uncaring government that wasn’t acting as if they were a priority. After years of struggle, waiting, and frustration, the arrival of Brad Pitt, movie star, with his earnest charm and optimistic ideas, must have felt to people from the Lower Ninth Ward like a gift from god. But what he actually did, whether he realizes it or not, was a little like what Blanco did when she gutted the public school system right after the storm. At the core of MIR’s mission to do what the government hadn’t was the beating heart of neoliberalism: private enterprise over public resources. Part 4 of “It’s the symptom, not the cause, Brad” will be published on ViaNolaVie on Monday, February 18. A note about sources: As I mentioned in the author’s note at the beginning of this article, I did not do any on-the-ground reporting for this story. Being in school in Massachusetts, I relied on 35 pieces of writing–from national and local magazines, websites, and books–for quotes, descriptions, and the other details necessary to create a piece of longform journalism. I am grateful to the reporters, writers, and academics whose work was vital to make this piece what I wanted it to be. The links embedded throughout my piece should serve as in-text citations for their work, and a full bibliographic entry (with page numbers, as necessary) of each source is listed below. Brinkley, Douglas and the Times-Picayune. “Brad Pitt talks about Hurricane Katrina, his Make It Right work and his love for New Orleans,” NOLA.com | The Times-Picayune, August 25, 2010, https://www.nola.com/katrina/index.ssf/2010/08/brad_pitt_talks_about_hurrican.html. Clarke, Gerald. “See How Brad Pitt Helped Rebuild New Orleans After Hurricane Katrina,” Architectural Digest, January 2009, https://www.architecturaldigest.com/story/brad-pitt-article. Feireiss, Kristin, ed. and Brad Pitt. Architecture in Times of Need: Make It Right Rebuilding New Orleans’ Lower Ninth Ward (New York: Prestel, 2009). Klein, Naomi. The Shock Doctrine, Picador, 2007, 518; 4; 7. Moore, Rowan. “Brad the builder in New Orleans,” The Guardian, March 13, 2010, https://www.theguardian.com/artanddesign/2010/mar/14/brad-pitt-architecture-new-orleans. MSNBC.com, “Katrina recovery: How to help,” NBCNews.com, August 25, 2010, http://www.nbcnews.com/id/38836467/ns/us_news-katrina_five_years_later/t/katrina-recovery-how-help/#.XBVOxi2ZORs. Solnit, Rebecca. A Paradise Built in Hell (New York: Penguin, 2010), 292; 276-77; 279. Storm, Stephanie. “Reports Critique U.S. Red Cross’s Katrina Response,” New York Times, April 4, 2006, https://www.nytimes.com/2006/04/04/us/reports-critique-us-red-crosss-katrina-response.html. Times-Picayune Staff, “Plan shrinks city footprint,” NOLA.com | The Times-Picayune, December 14, 2005, https://www.nola.com/politics/index.ssf/2005/12/plan_shrinks_city_footprint.html.